A recent survey by Text Marketer, published by SocialMediadd, shows that businesses using SMS Message marketing are getting a 29% response rate as opposed to 1% for email marketing. People feel more comfortable giving out their phone number to businesses, and very few businesses are sending them text messages. This makes the ROI for text messaging extremely high. -The five industries that use business SMS the most are recruitment, software, marketing agencies, retailers, and financial services. 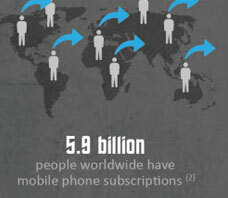 -The mobile U.S. ad revenue will grow from $3.3 billion in 2011 to $20.6 billion in 2015. -45% of customers notice all mobile advertising. "Our dental office clients have seen great returns in their SMS campaigns. They usually set up automatic text reminders for their teeth cleanings and annual checkups. These messages will have a link with their phone number that allows for a simple click and call. People feel more comfortable giving out their phone number to businesses, and very few businesses are sending them text messages. This makes the ROI for text messaging extremely high."